By: Dr. Bill Vandergrift, EquiVision, Inc.
Optimizing the health, soundness and growth of your foal begins with adequate nutrition and management of the broodmare. Proper feeding management of the broodmare is easy yet critical for your foal’s development. This short paper will present basic guidelines for the management and feeding of the broodmare that will increase your chances of producing a healthy and sound foal. The most common mistakes made in relation to feeding broodmares include 1) feeding too much grain during gestation, 2) underfeeding minerals and vitamins during gestation, and 3) not feeding enough grain during lactation. Maintain mares in a moderate body condition. When utilizing the Henneke body condition scoring system this corresponds to a score between 5 and 7 with 5 being the target. Feed the smallest amount of grain required to maintain the mare in a moderate body condition. If the mare does not need any grain to accomplish this then you do not have to feed her any grain. A small amount of grain per day is acceptable to facilitate the mare remaining socialized and to provide a means to mix mineral and vitamin supplements with in order to ensure an adequate mineral and vitamin intake. A mare that is fleshy on forage alone is acceptable, but a mare that is fleshy because she is receiving more grain than she requires is not. Mineral and Vitamin Intakes During Gestation Regardless of the total amount of forage and grain fed to the broodmare, it is very important that she receives an adequate mineral and vitamin intake in order to ensure proper development of the fetus in utero. Sufficient mineral and vitamin intakes are often supplied when the broodmare is fed approximately 5 to 6 pounds or more of a properly fortified grain mix. However, if less than 5 pounds of a fortified grain mix are being fed, an alternative means is required to supply the broodmare with an acceptable mineral and vitamin intake to support proper fetal development. Approximate nutrient requirements of 1100 pound mares during the first and second half of gestation and during lactation are listed in table 2. As illustrated in table 2, with the exception of vitamins A and E nutrient requirements of non-lactating mares prior to the second trimester of gestation are no different from those of mares at maintenance. Mares at this stage of production can usually obtain all the protein and energy they require from good quality pasture and/or hay as illustrated in figure 1. However, depending upon the mineral content of the forage, mares will usually be quite deficient in zinc, copper, selenium, vitamin A and vitamin E. The basic question in this situation is how to provide the mare with enough supplemental minerals and vitamins without providing excessive amounts of energy and protein. The most feasible way to accomplish this is to provide a feed or supplement high in minerals and vitamins, but low in protein and energy. Many people are of the understanding that mares in the second half of gestation require much more protein and energy than mares at maintenance or in the first half of gestation. 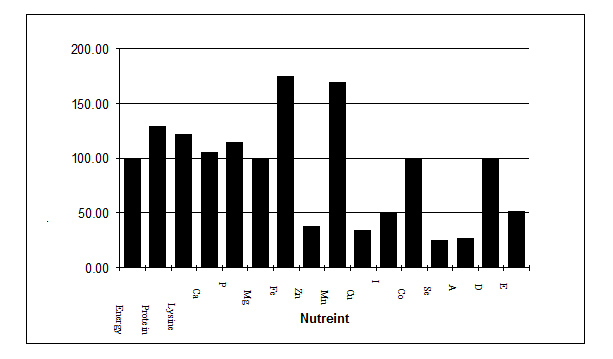 However, as illustrated in table 2 the nutrient requirements that increase the most are calcium and phosphorus not protein and energy. While mares do require slightly more protein and energy during the second half of gestation, they are still able to obtain enough protein and energy from good quality forage in most cases as illustrated in figure 2. However, their intake of minerals and critical vitamins becomes more deficient if they are not properly supplemented. This deficiency is not as critical for the mare as it is for the developing fetus. In fact, chances are you would not be able to tell that the mare was suffering from a deficiency simply by her visual appearance. Since she is receiving adequate quantities of protein and energy, her body condition should remain adequate. The largest problem encountered under these circumstances is the foal being born weak and very susceptible to structural and health disorders. Therefore, during the second half of gestation, it becomes extremely important for the mare to receive supplemental minerals and vitamins in a form that does not cause her to become over conditioned. While protein and energy requirements increased a moderate amount during gestation they increase a significant amount during lactation as illustrated in table 2. Due to this substantial increase in protein and energy requirement levels it usually becomes necessary to feed grain to lactating mares in order to maintain their body condition at a moderate level. Since the foal is no longer developing in utero, the advantage of providing the mare with extra minerals and vitamins for the purpose of benefiting the foal is no longer important, assuming her basic mineral requirements are being satisfied. Mineral and vitamin requirements do increase during lactation, however, the intake of critical minerals and vitamins is often met when the total feed intake is increased to meet the protein and energy requirements of lactation. Due to the fact that protein and energy requirements increase substantially upon lactation, the mare is most often fed greater quantities of a grain mix and/or a different grain mix altogether. Since the mare is undergoing a fair amount of stress at the time of foaling, it is advisable to make the change in her ration before she foals. However, care should be taken not to overfeed the mare during gestation. Grain intake levels should follow the mare’s milk production as closely as possible. Mare’s milk production usually reaches maximum levels approximately 6 to 8 weeks into lactation, this is the time when she should receive the greatest amount of grain. From a practical standpoint, simply feed enough grain to maintain a moderate body condition while realizing that you should be increasing the grain intake up to 8 weeks of lactation and then gradually reduce the grain intake following peak lactation in order to prevent the mare from becoming over-conditioned. Due to the fact that calcium and phosphorus intakes are very important to the lactating mare, we must ensure that she is able to efficiently utilize the calcium and phosphorus she consumes. The inclusion of fermentation enhancers can improve the availability of calcium and phosphorus in the mare’s diet which in turn may increase bone strength of the foal. Improved mineral status of the mare usually results in improved re-breeding success rates as well. Many mares exhibit problems associated with breeding, especially with the maintenance of pregnancy within the first 60 days of gestation. Early embryonic death loss can be associated with improper nutrition, reduced stress resistance and/or increased susceptibility to disease. The inclusion of organice minerals in the diets of these “problem” or “no-excuse” mares has been successfully utilized to reduce problems associated with early embryonic loss. The exact mode of action by which organic minerals improve breeding success rates in these mares is unclear at this time. However, clinical trials have demonstrated that mares receiving organic minerals increase the number of viable embryos produced per ovulation cycle and exhibit improved health of uterine tissue. Increases in breeding success rates from 85% to 95% on individual breeding farms with the inclusion of organic minerals into the diet of their mares at least 30 to 60 days prior to breeding is not uncommon. maintaining mares in a moderate body condition by not over-feeding protein and energy during gestation or under-feeding protein and energy during lactation. feeding mares as much forage as possible with the minimum amount of grain needed to maintain a moderate body condition. ensuring that mares receive adequate mineral, vitamin A and vitamin E intakes during gestation. (this usually requires 5 – 6 pounds or more of a properly fortified feed or supplementation with an appropriate product. utilizing a feed product that contains fermentation enhancers and organic minerals. Table 1. Description of Individual Body Condition Scores. 2 Very Thin Emaciated; slight fat covering over base of spinous processes; transverse processes of lumbar vertebrae feel rounded; spinous processes, ribs, tailhead, tuber coxae and ischii prominent; withers, shoulders, and neck structure faintly discernible. 3 Thin Fat buildup about halfway on spinous processes; transverse processes cannot be felt; slight fat covering over ribs; spinous processes and ribs easily discernible; tailhead prominent, but individual vertebrae cannot be identified visually; tuber coxae appear rounded but easily discernible, tuber ischii not distinguishable; withers, shoulders, and neck accentuated. 4 Moderately Thin Slight ridge along back; faint outline of ribs discernible; tailhead prominence depends on conformation, fat can be felt around it; tuber coxae not discernible; withers, shoulders and neck not obviously thin. 5 Moderate Back is flat (no crease or ridge); ribs not visually distinguishable but easily felt; fat around tailhead beginning to feel spongy; withers appear rounded over spinous processes; shoulders and neck blend smoothly into body. 6 Moderately Fleshy May have slight crease down back; fat over ribs spongy; fat around tailhead soft; fat beginning to be deposited along the side of withers, behind shoulders, and along sides of neck. 7 Fleshy May have crease down back; individual ribs can be felt, but noticeable filling between ribs with at; fat around tailhead soft; fat deposited along withers, behind shoulders and along neck. 9 Extremely Fat Obvious crease down back; patchy fat appearing over ribs; bulging fat around tailhead, along withers, behind shoulders, and along neck; fat along inner thighs may rub together; flank filed with fat. Source: adapted from Henneke et al. 1983, Eq. Vet. J. 15:371-372. Table 2. 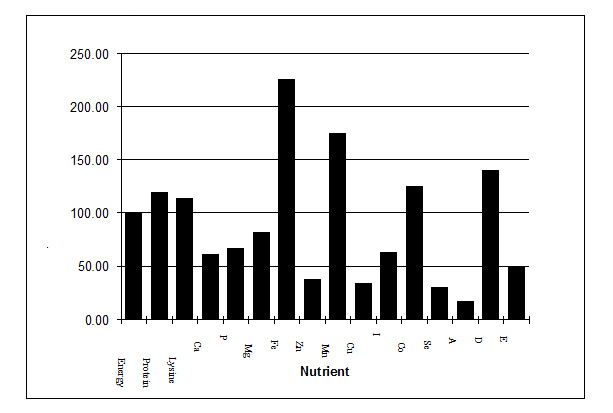 Approximate nutrient requirements of 1100 pound mares during the first and second half of gestation and during lactation. Calcium 20 20 36 60 gms. Figure 1. Nutrient intake of 1100 pound mares on a 100% forage diet expressed as a percent of their requirement during the first half of gestation. Figure 2. Approximate nutrient intake of 1100 pound mares from a 100% forage diet expressed as a percent of their requirement during the second half of gestation.